Things in the Sea are Touching Me! "This light-hearted rhyming story follows the experience of a little girls day at the beach with her two mums, as she unexpectedly encounters a range of sea life with a fun twist at the end! We all know that breath-catching feeling of something brushing past our shins as we wade ... read full description below. 'Look in the water, Ma! Golly, oh gee! 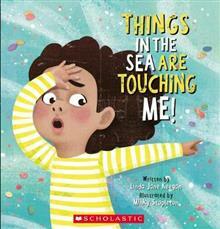 Some THING in the sea is TOUCHING ME!' Youll squawk, screech, yelp... and laugh out loud at the surprises for all on this funny-sunny family day at the beach. When a small child goes to the seaside with her Mum and Ma, she is unprepared for 'things' floating in the water. Ma explains what each one is and that it is nothing to be afraid of... then gets a big fright herself when Mum grabs her ankle!